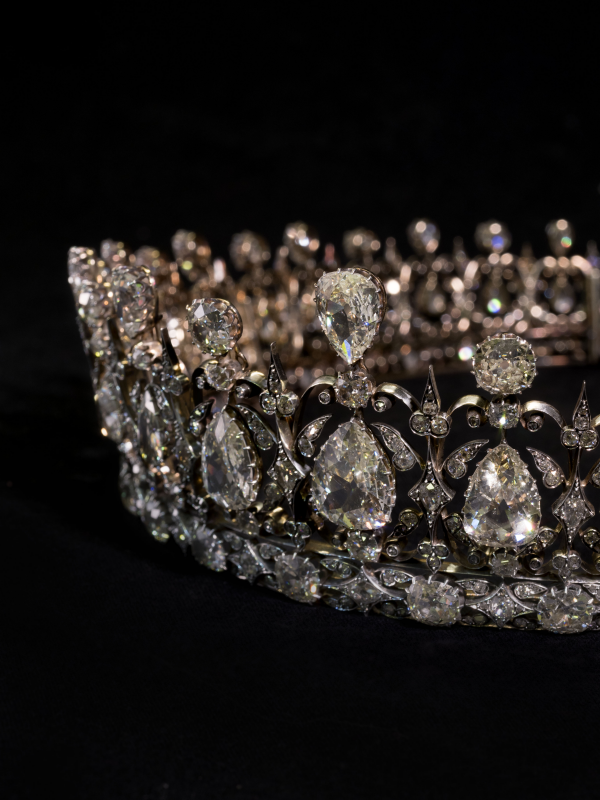 We learned late last year that two magnificent tiaras made in the reign of Queen Victoria would soon be going on display at Kensington Palace, and on Friday, the public will finally see them sparkling in action. And even better -- there's a surprise third royal tiara involved! Here's the scoop on the jewels you'll see in the palace's revamped "Victoria Revealed" exhibition. All of the jewels that have been newly placed in the exhibition belonged to members of the British royal family. The diamond and emerald tiara, as well as its accompanying parure, were all owned and worn by Queen Victoria. 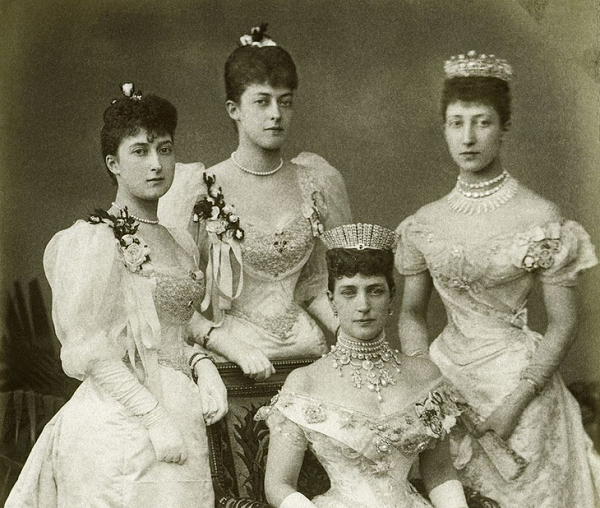 The two all-diamond tiaras on display belonged to her granddaughter, Princess Louise, Duchess of Fife. 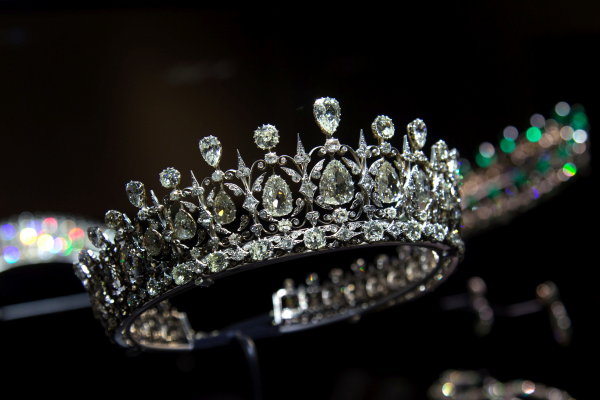 The amazing emerald and diamond tiara looks gorgeous under the museum lighting, doesn't it? 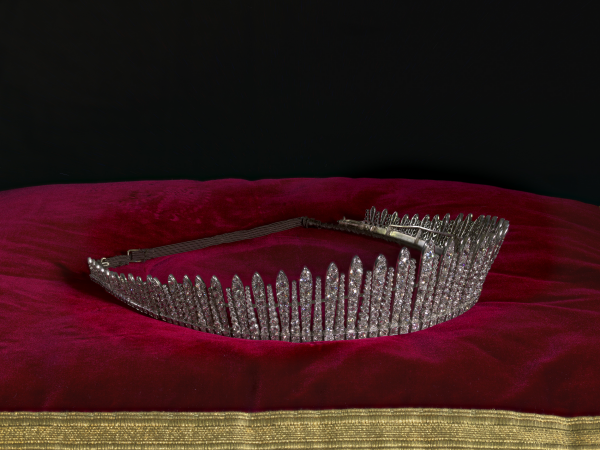 The tiara was designed for Queen Victoria by Prince Albert and made by Joseph Kitching. The symmetry of the piece is typical of the jewels designed by Albert for Victoria. 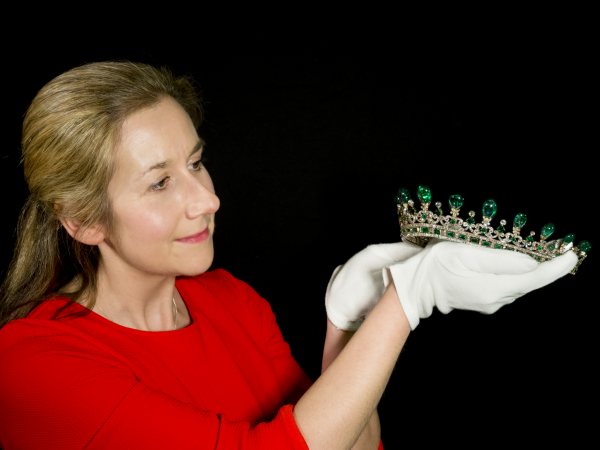 In a press release for the new exhibition, Historic Royal Palaces describes the tiara as "set with cushion-shaped diamonds and step-cut emeralds, and surmounted by a graduated row of 19 inverted pear-shaped emeralds, the largest of which weighs an astonishing 15 carats." Here, in the hands of one of the Historic Royal Palaces conservators, you get a good idea of the size of the diadem. 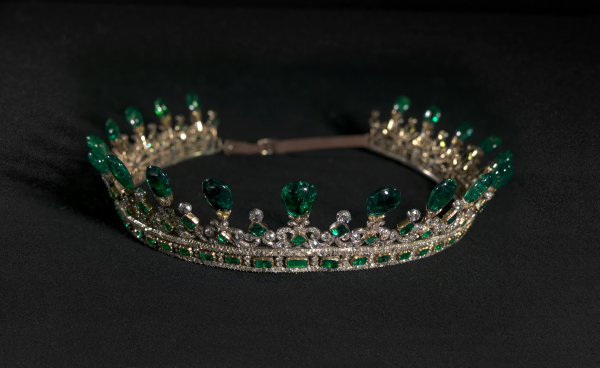 Victoria was thrilled with her present, noting in her journal that her husband had "wonderful taste" and that she was delighted to wear the "lovely Diadem of diamonds and emeralds designed by my beloved Albert." Exactly how long Queen Victoria kept the tiara -- and what she did with it -- aren't precisely clear. 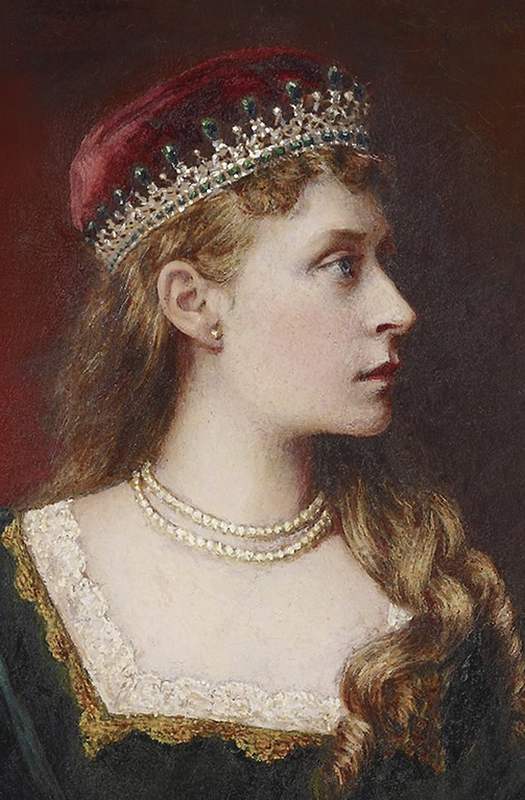 In the 1880s, a granddaughter, Princess Victoria of Hesse and by Rhine (grandmother of the Duke of Edinburgh), was depicted wearing the tiara as part of a costume. 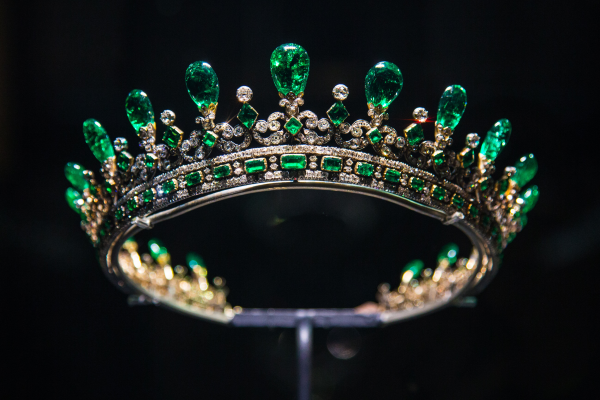 And when an inventory of Victoria's jewels was made in 1896, the emerald tiara was not included. Decades later, Caroline, wife of the 3rd Duke of Fife, was photographed wearing the tiara and its accompanying suite of emerald jewelry at the 1960 State Opening of Parliament. It's possible, then, that Victoria gave the tiara directly to the 3rd Duke's grandmother (and her granddaughter), Princess Louise, Duchess of Fife. Here's a look at the rest of the jewels that make up the married parure. 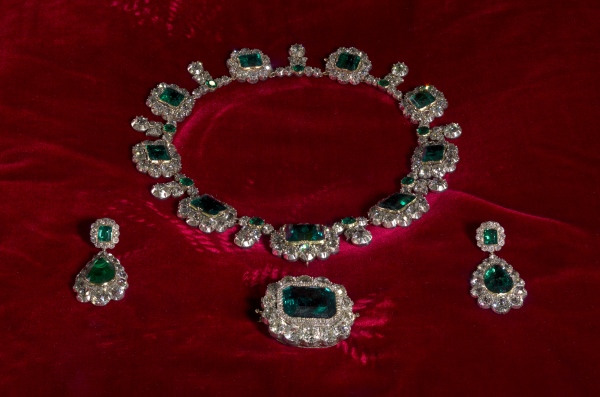 The other pieces -- "a necklace formed of 9 oval emerald clusters, each set within a border of cushion-shaped diamonds, its accompanying pendant earrings and an impressive 20ct emerald and diamond brooch" -- were made in 1843 and given to Victoria by Albert. The tiara was later made to "complement" the set. 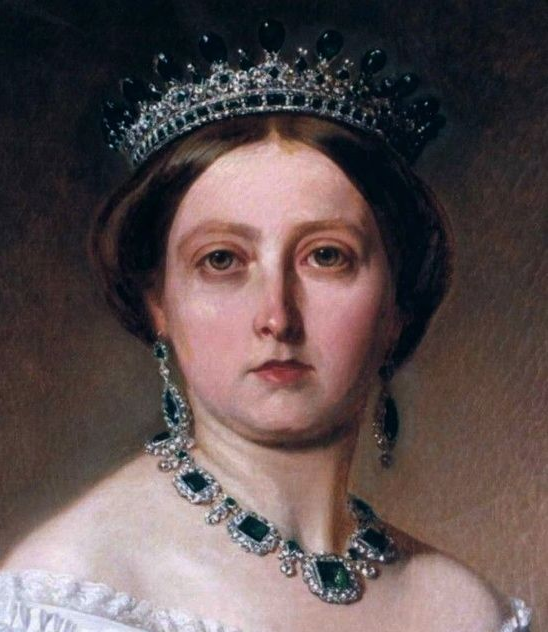 Here's a portrait of Victoria wearing the tiara with the earrings and the necklace. 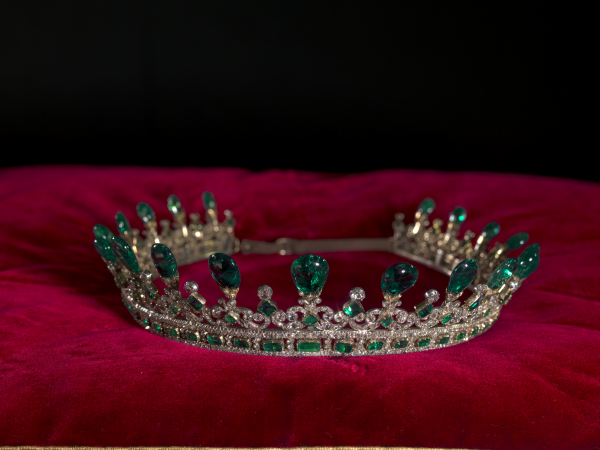 All of the diamond and emerald pieces, including the tiara, are on on long-term loan to Historic Royal Palaces from the estate of the 3rd Duke of Fife, who died in 2015. 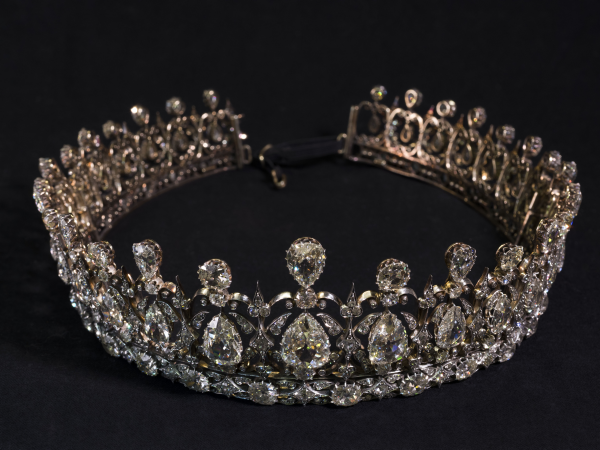 Designed by Oscar Massin, the tiara was a wedding present given to Princess Louise of Wales, daughter of King Edward VII and Queen Alexandra, by her new husband, the Duke of Fife, in 1889. A special issue of The Graphic, published in August 1889 to celebrate the Fife wedding, described the tiara as follows: "in a very uncommon and beautiful design, composed of hundreds of stones, ranging in weight from one carat to ten, the larger being what are technically known as briolettes -- that is cut on both sides and turning on pivots so that they will flash with every movement of the head." 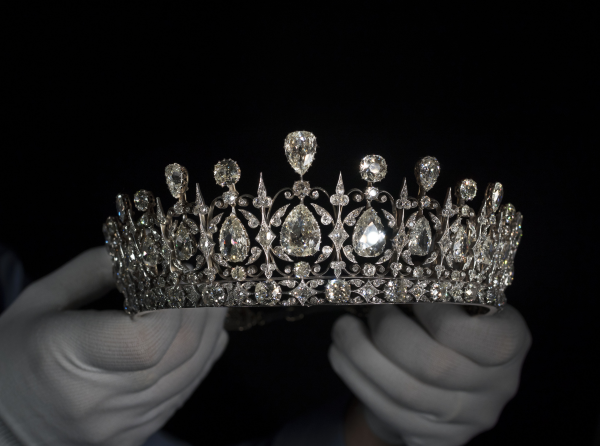 Another contemporary news report describes the tiara given by the duke as "a mass of diamonds, and one of the most valuable pieces of work in England." Here, Louise wears the Fife Tiara in an early postcard portrait, pairing the tiara with pearls. After Louise's death, the tiara was inherited by her elder daughter, Princess Alexandra, 2nd Duchess of Fife. She wore the tiara at a pair of coronations: the 1937 coronation of King George VI, and the 1953 coronation of his daughter, Queen Elizabeth II. Alexandra's only son, Alastair, died without issue, and the tiara was eventually inherited by her nephew, the 3rd Duke of Fife. It was worn by several family brides, including the current Duchess of Fife. Now the tiara belongs to the nation. 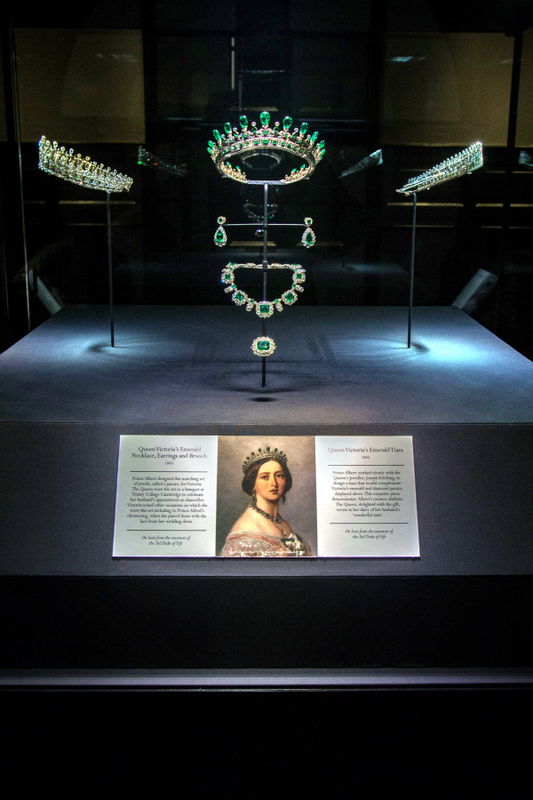 The press materials for the reopening of the "Victoria Revealed" exhibition also included a tiara surprise: the jewelry display also includes another tiara that belonged to Princess Louise, Duchess of Fife. 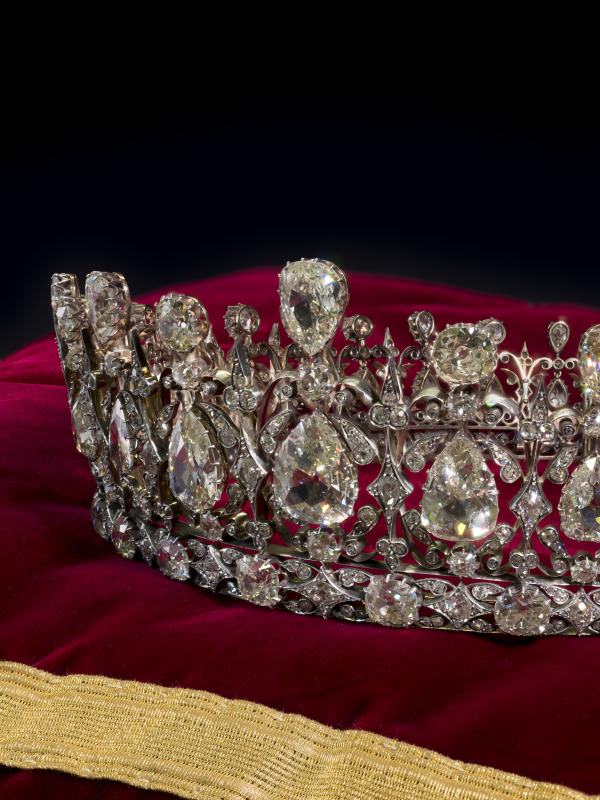 This classic diamond fringe, which can be worn either as a tiara or a necklace, was given to Louise as a wedding present by her parents, King Edward VII and Queen Alexandra. The Illustrated London News described the fringe as composed "of fine brilliants, of elegant design of alternating and graduating rays, varying from nearly two inches long in the centre to half an inch at the extreme ends." 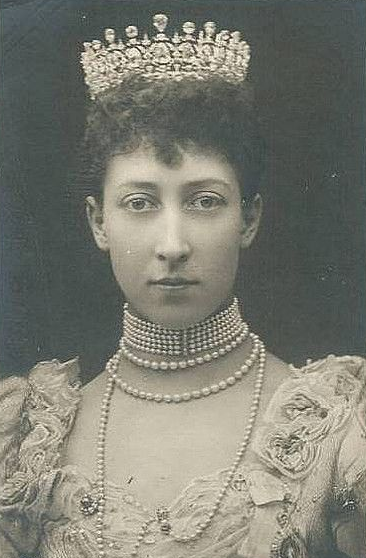 Louise was photographed wearing both the Fife Tiara and the diamond fringe necklace in July 1893 during the wedding celebrations for her brother, the Duke of York, and his bride, Mary of Teck. (They later became King George V and Queen Mary, grandparents of the present Queen.) Like the emeralds, the diamond fringe is also on long-term loan from the estate of Louise's grandson, the late 3rd Duke of Fife. If you're in London, I highly recommend a visit to Kensington Palace to see the exhibit. I visited in 2013, long before the fabulous jewelry additions, and thoroughly enjoyed it. 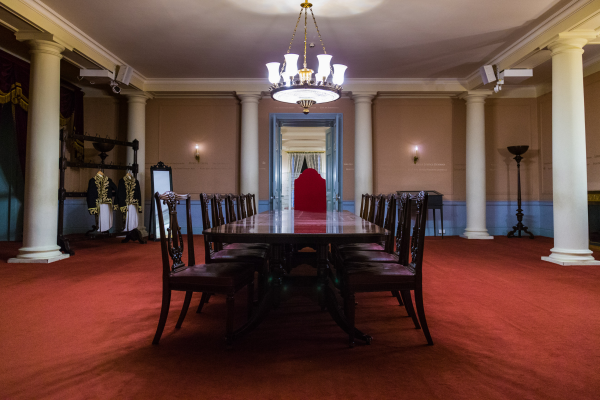 Other highlights include the room where Victoria held her very first privy council meeting (pictured above). When I was there, the exhibition also included Victoria's wedding dress, though I'm not sure whether it still does. Regardless, you're not going to want to miss a chance to see this one -- especially with the new bejeweled additions! The exhibition reopens to the public tomorrow (Friday, March 30, 2018). Be sure to let us know if you stop by!